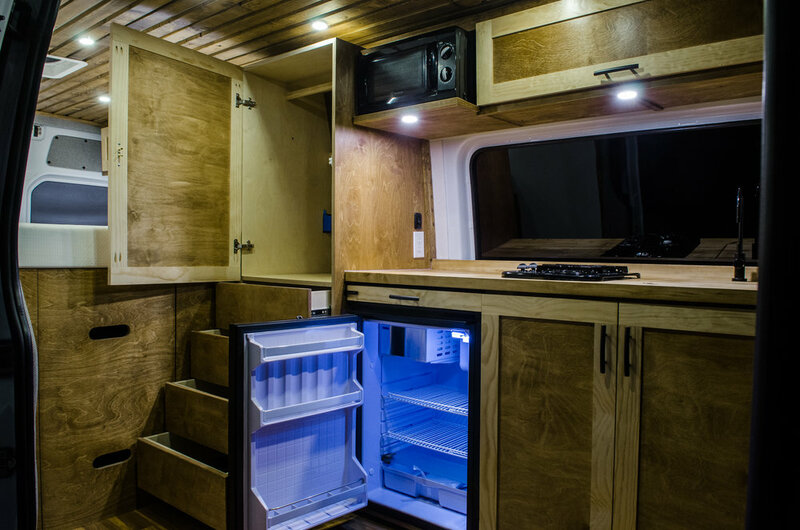 Tucker's 170" Sprinter features a tall closet with modern hardware, full Renogy solar capability including BattleBorn lithium storage batteries, a CNC cut butcher block counter atop a cozy kitchenette, diesel heater with thermostat, Isotherm refrigerator, and plenty of under bed storage. Every surface in Tucker's Sprinter was hand cut, sanded, stained, and sealed to create the custom finish that was desired. Custom touches are found throughout the van and its unique look assures that there is nothing else on the road like it. A high mounted bed allows for plenty of storage space for solar/home battery storage, inverter, solar controller, shelving, bike mounts, and so much more. With 300W of Renogy solar panels and three BattleBorn Lithium batteries to store the power you can bring you home ammenities on the road. Tucker's Sprinter houses a microwave, Isotherm marine refrigerator, USB chargers, and more to make your time on the road feel like home. This van features enough room for a queen size 6" memory foam mattress in the back. This vehicle also features a hand made "slatted" ceiling complete with LED lighting throughout.